Ever wonder why a patient has HTN in a(n) aortic aneurysm? 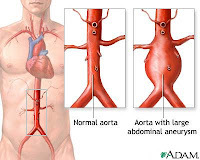 The reason for this because when the blood is passing through the aorta, in some cases, the blood may break through the intima and enter in the media layer. This causes the media layer to rip apart, hence the tearing sensation that a patient may feel. Due to the high pressures in the aorta it will causes the tear in the aorta to worsen. For this very reason, it is important to control the patient's BP. In the hospital standpoint, they can give certain medications that will cause a decrease in the BP to a maintainable level. Care for the patient in the hospital, would require ICU/CCU, vigorous monitoring before and after surgery, and medications to control the BP from becoming hypertensive. For the pre-hospital standpoint, we can give morphine. This is because morphine decreases the preload to the heart, thus reducing the blood pressure. Morphine will also decrease the heart rate, which in turns, will cause the heart to work less, which may sound funny, but is a good thing. As always, you have to follow your local protocol to see how you manage your DAA (dissecting aorta aneurysm). Still, these patients require the normal: ABCs, ECG monitoring, IV, etc. Monitor your patient, and monitor them closely. As the DAA progresses, the patient is at a high risk for a CVA, pericardial tamponade, and an AMI. Priority 1 this patient to the closest appropriate facility.